It nearly didn't happen. You nearly weren't in my life. I was too full of uncertainty. I wasn't sure that you'd be a great fit. I just couldn't get my head around the concept of you and I. But I took the gamble, and I'm so glad I did. Ladies and gentleman, I am talking about: the over-sized white blazer. Something I've since decided that everyone needs in their lives. Mine was a sale piece from Forever 21. It was a standard fit blazer and love at first sight. Although it did present a bit of a dilemma: it was only available in "large". Medium would've been fine at a push. But large? Not so much. I decided to give it a go. Because I am in no way sizist. Fast forward a few days and the blazer arrives chez moi. An off-white sort of colour, it wasn't what I was expecting. I notice how large it is and have reservations. But once on, I decide that I oddly like the fit. Rather than look-at-me-I-once-weighed-a-lot-more-than-I-do-now, it looked like I'd borrowed the blazer from a bloke - which is what all the cool kids do these days (or so I hear...). But having said that, I did still have some reservations. You know that apprehension of wearing something new in public that you're not 100% sure about? So the blazer sat collecting dust for a little while. Then came the job interview. I was recommended for a role elsewhere by an ex colleague of mine and I needed to dress to impress. I knew I had pencil skirts and suits hanging in my wardrobe back from where I used to work for a bank, but suits have always made me feel a bit uncomfortable. And I must stress the importance of feeling comfortable in an interview. As the role was within media still, I didn't want to be TOO formal. "Smart casual" would be fine. I pulled on some skinny jeans and deliberated over the white blazer. Which as luck would have it, worked really well. Had the blazer been fitted, I may have appeared too "corporate". The good news? They offered me the job that very day! Although skills, experience, and how you answer your interview questions are largely key to your success, I really believe that feeling at ease with what you wear forms a big part of it too. And if you're curious... this is the Forever 21 blazer in question. The perfect light-weight summer cover up. So next time the sales / Primark / wherever lack your usual size... take a chance. You just never know! Congratulations on the job! I think I have the same blazer? 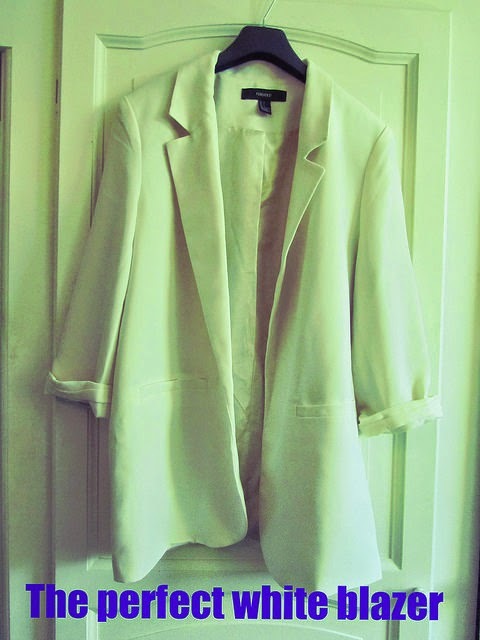 :) Well, my white F21 blazer served me well for three years until I replaced it with a Zara number. Like yours, mine was off-white and I was itching to have a whiter-than-white one! Couldn't live without it, definitely my ultimate wardrobe staple. Ooh love it. I just bought a cream blazer that I'm in love with. Blazers are my new favourite thing, I love wearing them with shorts in the summer.